Santa Catalina is one of those out-of-the-way beach towns with its own quiet charm. As you walk through town along one of the two narrow streets you pass young men with their surfboards under their arms, headed for the break. Kids on bicycles roll past, avoiding a dog or two. The bus from Santiago arrives and a few backpackers get off, hoisting their loads as they’re passed down from the top of the bus. A pickup truck inches along as the driver announces the fresh produce he’s selling from the back. ”Hay piña, melon, sandia y papaya. Hay cebolla, papa, tomate, y repollo,’‘ he says into a loudspeaker. Today he has pineapples, cantaloupes, watermelons and papayas, as well as onions, potatoes, tomatoes, and cabbage. 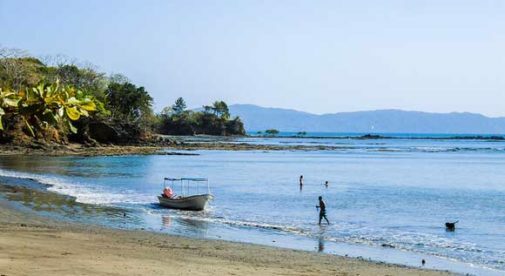 The road ends at the beach, where you can see locally-owned fishing pangas anchored just offshore, and the view stretches to the endless horizon. There’s more than one Santa Catalina in Panama, and the one I visited is at the southern end of Veraguas Province. 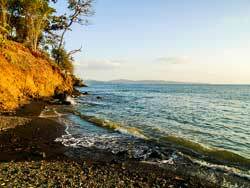 It’s located west of the Azuero Peninsula along Panama’s Pacific coast near the island of Coiba, the largest island in Central America. The southern exposure and protected shoreline originally drew fishermen seeking tuna, snapper, marlin, sea bass, and other delicacies. Surfers discovered the consistent breaks a few decades ago and kept the area a closely-guarded secret. Scuba divers began visiting once Isla Coiba opened up as a diving destination in 2005. Today, Santa Catalina still attracts anglers, surfers, and divers, along with tourists and expats who want to get off the beaten path. To get there you take the Pan-American Highway to Santiago then head southwest to the town of Soná. The drive from Panama City takes about five hours in a rental car, and there’s a shorter route from David that avoids Santiago. Regular bus service is reliable and inexpensive between Panama City or David and Santiago, then on to Soná and Santa Catalina. With a full-time population of about 400 and perhaps 50 expat residents, Santa Catalina is very small. The village itself consists of two roads: one brings you into town and carries you on down to the Santa Catalina Beach; the other turns off to the left and winds around, ending at Estero Beach. Dive shops, two grocery stores, an elementary school, and a few surfing shops make up the commercial center. A number of B&Bs, inns, hostels, and surf camps offer accommodation and a surprising variety and number of eateries serve up good meals. Until recently, Santa Catalina wasn’t even on anybody’s radar. In the last few years infrastructure improvements have made it a more feasible destination, including more reliable cell phone and internet service, better roads and tourism promotion. Still, it takes an adventurous spirit to adapt to life in Santa Catalina—you won’t find any fast-food places, no bank or ATM, no gas station, no gourmet deli. You will find a welcoming community in a scenic beach-front locale with a laidback lifestyle and youthful outlook on life. The small beach town of Santa Catalina is the perfect place for a simple, laidback lifestyle. Because it’s such a small village, real estate offerings are limited and there’s no realtor in town. Through local contacts I found a two-bedroom, two-bathroom, newly built home, ready to move in, listed for $219,000. Constructed to North American standards, it features granite counters, wood finishes, an upstairs loft, and private back patio. Occasionally existing homes come on the market and you might find good value if you’re interested in upgrading a typical local home. For a purchase price around $70,000 and an additional investment around $30,000 for renovations, you could have a nice two-bedroom home on a lot near the beach. With few new and resale homes on the market, a better option may be to buy land for your custom home. Lots in town are available for $40,000 or $45,000 with larger parcels on offer outside of town. Pricing depends on location, naturally, with waterfront property commanding higher prices. For a total investment of $150,000 to $200,000, you could have your own lot with a custom-built home in this quiet beach town. Here’s an insider tip—it’s a good idea to assure your own water source, such as a well and a storage tank. The local water association is informal and you’ll want to have your own reliable water supply. Also, make sure that the location that interests you has good electrical service and cell phone reception. There’s a decent range of rentals on offer so you’ll have a place to stay while your dream home is under construction. You’ll find rentals in and around town ranging from $350 for basic dwellings to $1,000 per month for more desirable locations, utilities included. Expect properties with the grandest views to carry the highest price tags.